When you already heard about Optocoupler devices, you may be heard also about CTR. CTR stands for current transfer ratio. In bipolar junction transistor this is the so called current gain or simply beta. It is the ratio of the collector to forward current of an Optocoupler. In circuit design involving optocoupler, you may be dealing with the device CTR and circuit CTR. Don’t be confused about these. Device CTR is the one specified in the component datasheet. Actually this is the CTR range that the device can still provide current transfer. In BJT, this is the range of beta wherein the device can still provide current amplification. In other words, this is the CTR that can make the circuit operate in linear mode. If you check an Optocoupler datasheet, you can see a table like below. This is showing the CTR range of a particular device. 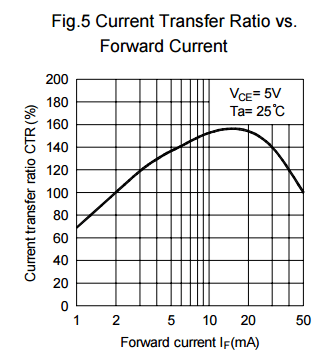 In my design approach I am not using the above table CTR range instead I look for the graph relating the forward current and the CTR as below. The graph is more accurate than the table data above since it has forward current information. For example the computed forward current is 10mA, from the graph the equivalent CTR is around 155%. In linear operation, device CTR and circuit CTR is the same and can be expressed mathematically as below equation. Go back to the graph above, any forward current value will have a corresponding CTR value and the collector current is can be solved as below equation. 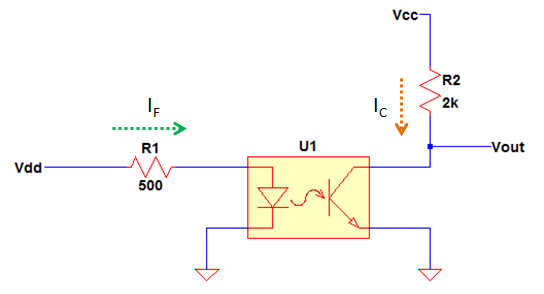 If we are going to relate in on a circuit like below, the value of Ic is dependent to the computed forward current and the corresponding CTR in the graph. This is always true as long as the operation of the circuit is at linear region. However, when the above circuit saturates the collector current is only opposed by the value of the collector resistor R2. So the collector current is can be solved like below. At saturation, the method used above by getting the collector current based from the forward current and the CTR from the graph is not anymore valid. If you still use it, you will get higher collector current that results to a negative collector-emitter voltage. The ratio of the collector current to the forward current computed at saturation is the one called as the circuit CTR. To summarize everything, optocoupler device CTR and circuit CTR is the same as long as the device or circuit is operating in the linear region. Once the operation is entering saturation, optocoupler device CTR and circuit CTR circuit is no longer the same. The former is always higher than the latter. Device CTR is affected by by several factors such as forward current, operating temperature and life or aging. To know exactly how these factors affect optocoupler CTR, read this.